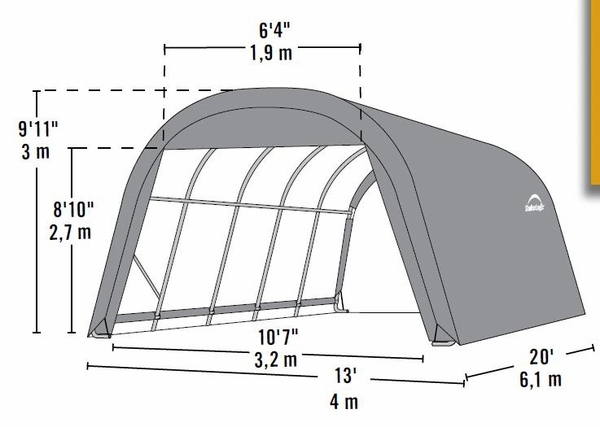 Door opening is 9'6" wide at base, tapering to a width of 6 feet at the height of 8'10"
This portable round garage is perfect for reliable vehicle protection or convenient storage without building a permanent structure. Built of high grade steel, the frame goes through a 13 step Rhino Shield surface preparation process. It is also bonded with a DuPont thermoset baked on powder-coated finish to eliminate any rust, weathering, chipping, and peeling. The slip fit connectors and swedged tubing allow easy assembly, and the wide-based foot pads on each leg ensure a dependable sturdy base and easy access to secure anchor points. 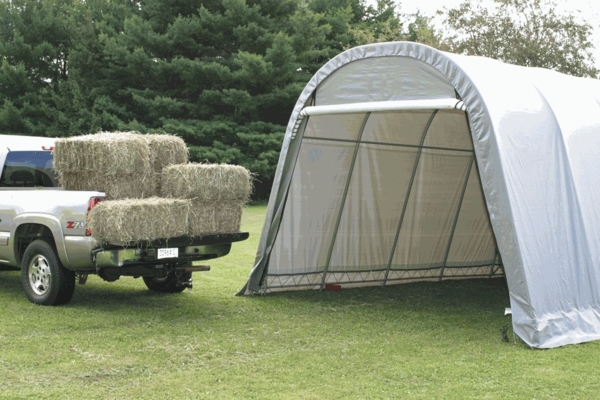 The frame is field tested to withstand all but the most rigorous weather conditions.